Taqueria Juanitos is a delicious madre-and-padre Mexican restaurant. There are no chips and guacamole here, but it is the closest thing you will get to eating at a taco stand in Mexico. 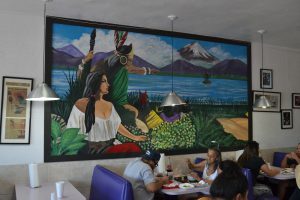 In Tucson, Juanitos, which is located in a building with a purple exterior on the corner of Grant Road and 15th Avenue, is a great place to unwind and get a filling lunch or dinner made from scratch. In 1986, Juanitos started as a food truck in Van Nuys, California, and grew into a free-standing building in 1987 in the San Fernando Valley. The concept was started by Juanito Sr., once of three generations of Juanitos. 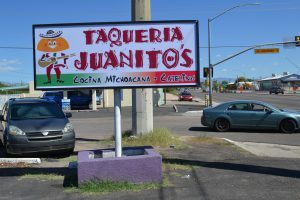 In 1996, Juanito Jr. started the Taqueria Juanitos in Tucson. The fast-casual restaurant’s variety of selections will leave you stuffed. The mixed burritos, for example, feature a variety of juicy meats with fresh rice, salsa, beans and cilantro. The flavor will flat-out blow your socks off, and each one costs only $6. The $5 taco plate comes with two tacos, rice and beans and is another satisfying and fresh option at Juanitos. The restaurant also serves authentic Mexican drinks on the menu, such as horchata and agua fresca. She said the restaurant has a “pretty big lunch rush” Mondays through Fridays and holds its own on Saturdays and Sundays. There is a lot of space for seating, however, so you won’t have to worry about finding a seat even with the busy crowds. The decor on the interior of the restaurant brings a unique Southern Mexico vibe that when you step through the door. The interior has paintings of an American Indian scene, some wrestlers and a man with a wicked mustache and a trench coat. The food is generally ready a few moments after you sit down, which is convenient because it also can be a nice drop-in spot to grab a quick bite to eat. Juanitos is liked by the people in the community as a affordable place to get and good filling meal. Diners like it for the variety of options that include vegetarian items and an array of meats. “I come here at least twice a week,” said Andrew Evans, a student at the University of Arizona. “My go-to meal has to be the taco plate. It comes with rice and beans, and you have to get the extra taco. The al pastor (marinated pork) is some of the best I have ever had.